Hacking Cable modems used to be very popular during the early 2000’s. People like DerEngel and Isabella from TCNiSO carried lots of research on the topic and talks from bitemytaco (R.I.P) and BlakeSelf during DEFCON 16 and DEFCON 18 covered lots of information on the subject. Securing cable modems is more difficult than other embedded devices because, on most cases, you can’t choose your own device/firmware and software updates are almost entirely controlled by your ISP. Most cable modems offer a limited administrative interface and management commands are sent using SNMP. 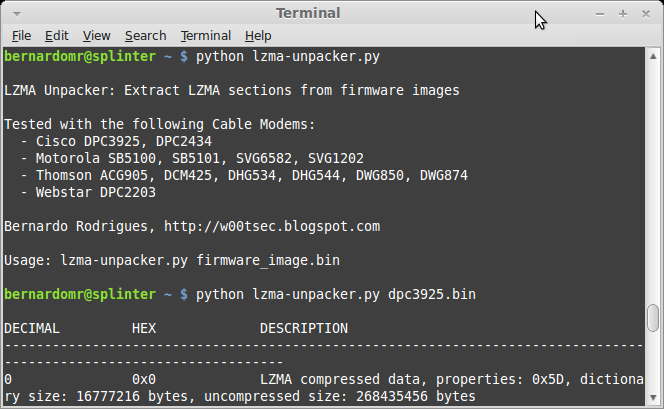 You can dump your own firmware image using JTAG or sniffing the connection during upgrades, for example. I’m a big fan of binwalk and I always wondered why it doesn't unpack firmwares from popular Broadcom based cable modems so I decided to research on this. For this analysis I’ll use Cisco DPC3925, which is a very common DOCSIS 3.0 modem here in Brazil. 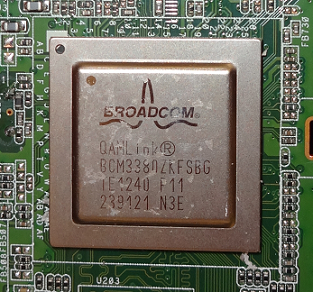 Cisco DPC3925 has a BCM3380 chipset, 16MB Flash x 64MB DRAM memory configuration. The compressed firmware image has around 4MB. Using strings against the file didn't help much and binwalk v1.2.1 (without any additional parameters) did not recognize it. We can gather lots of useful information from the vendor’s page: user guides, datasheets, licensing information and open source disclaimer for the product. 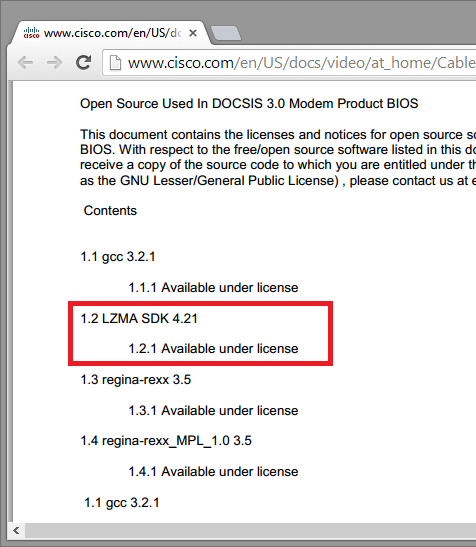 There are no sources available on Cisco's home, but the Copyright Notices section states that the product uses LZMA SDK 4.21. The LZMA header is not well documented. There are some good resources on lzma-purejs Github and you can also check binwalk's magic file signatures (devttys0 already did all the hard work for us). 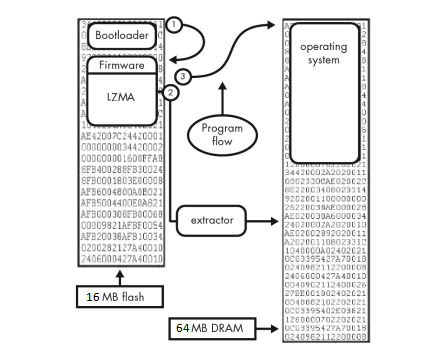 The Bootloader in the beggining of the flash contains the necessary information to boot the firmware image. On the top of the firmware there's always an extractor which decompress the firmware into DRAM. Offset 0x677 is a good candidate because it's located in the beginning of the file and it seems to have a valid header. 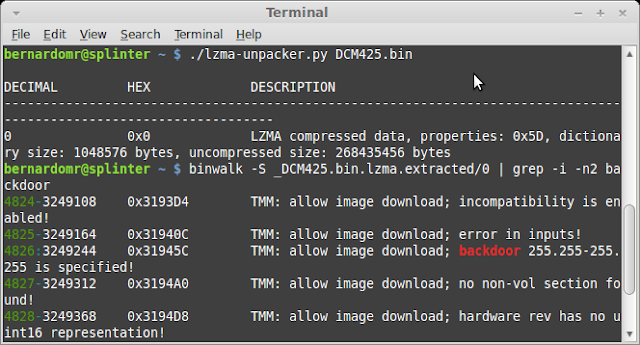 5D 00 00 00 01 indicates a LZMA compression level of -8 and the next 64 bits should be the data's uncompressed size (in little endian). The 64 bits following the header (00 20 20 0E 3A 28 AB EF) is clearly not a valid uncompressed size (2898643604054482944 bytes). It represents the actual compressed data, making binwalk and 7zr unable to extract it. 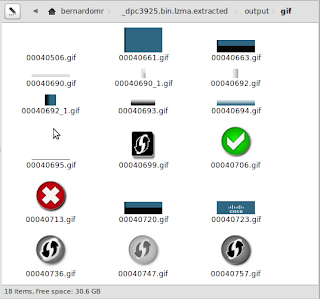 The data was extracted successfully and contains 21982740 bytes. 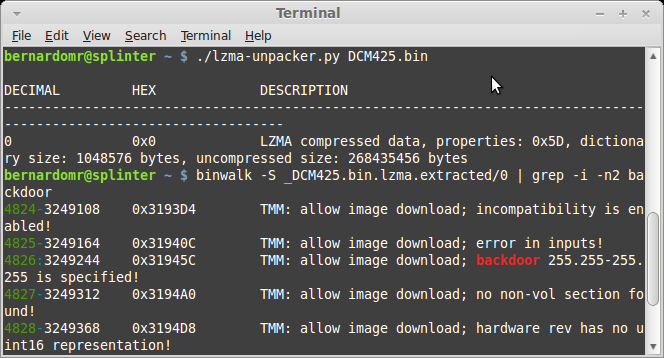 If we replace the uncompressed size on the LZMA header with the correct value in Little Endian (14 6E 4F 01 00 00 00 00), the 7zr tool would not complain about the file integrity. Ótima análise do firmware, parabéns pelo texto! 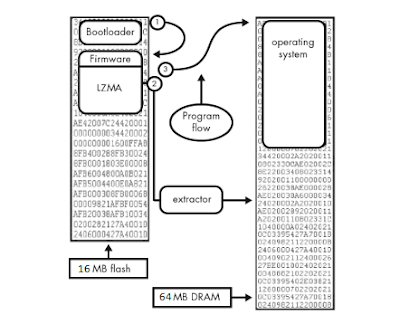 Sobre o bootloader, é possível fazer uma análise dele para habilitar o console via serial? What way did you dump the firmware? I have an EPC3925 and would like to see if I can retrieve the firmware off it. Cheers thanks. I actually read these threads earlier today! DO you use USB JTAG? I was thinking in investing in one of these. But this area is pretty new to me. Hi Damien, I currently own a FlashcatUSB (http://www.embeddedcomputers.net/products/FlashcatUSB/) which is older and cheaper. USBJTAG NT has the best support and compatibility out there and their software is very good. Thanks for that. I want to test the firmware specifically no my modem also as its ISP specific. Plus would learn the hardware side of things also! You hardly took a pic when you had the FlashcatUSB wired up to the SPI interface did you? 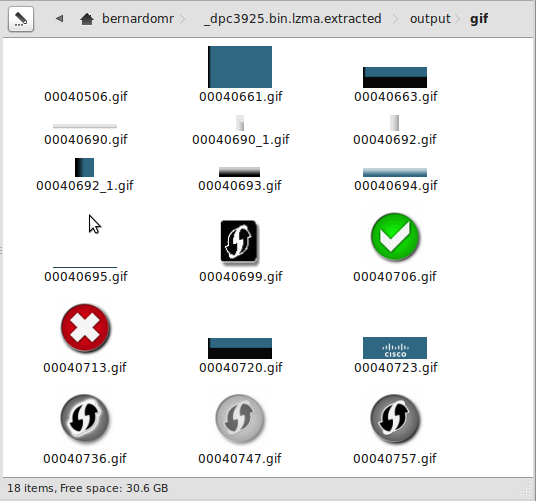 Estimado, junto con saludar, como puedo descomprimir y posteriormente comprimir el firmware del DPC3925, se como hacerlo en el SB5101, sin embargol dicha aplicación no soporta comprimir volúmenes superiores a 1mb de firmware, desde ya agradecido. very nice Post!! Thanks for sharing. 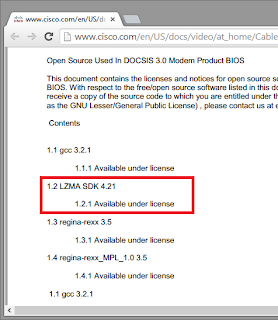 Search a long time for informations about the cisco modem's. My Provider rent my router as a modem (because it have only one port). Did you found any backdoor for ssh / telnet (e.g. a Web-GUI) activation ? I ordered already parts to read out the firmware. Hi MaCXyLo, I did not have much time to test it yet. Some modems like the Webstar DPC2100 have a firmware upgrade page at specific URI's (http://192.168.100.1/__swdld.asp). Try to carve and find HTML pages (using foremost or the latest binwalk-dev), analyze the strings, search for *.asp to identify hidden pages and */goform/*, which is used for dynamic actions. 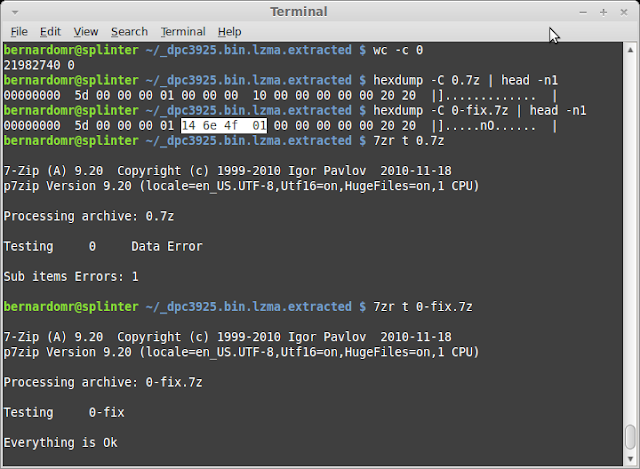 The modem is MIPS-based, you can also try reverse engineering it with IDA Pro. Awesome post! Just discovered this while I was looking for CMImageTool ;) This is way better. Any chance of adding support for SBG6580? Join us on #surboard_hacker sometime. Will be nice to chat with you. SBG6580 disassembles just fine using the same commands. You can add it to the list of devices it works on. Thanks for the reply Bernardo. Nice to see binwalk just enable it as a plugin by default, sure is coming in handy. Hey Mike, sorry for the late reply. Regarding the 255.255-255.255 backdoor, I didn't spend much time reversing it, as you may noticed that was a simple recursive grep, but it may reveal some interesting info. I'd like to invite you to cooperate on a modem firmware project, for a generous reward. What's the best way to contact you? I'd like to offer a $2000 reward for a modem firmware project. Email bobcat at adacity . net for details! I will certainly browse through your other posts later. Thanks!! 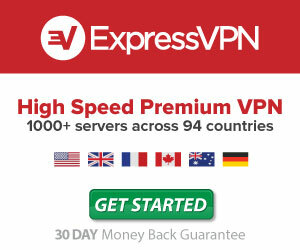 É possível subir uma config de velocidade nesse modem? I'm fighting with DI-524 rev.B4 with RDC R2600(also know as AMRISC 10100 processor)(probably 16bit x86 instruction set). 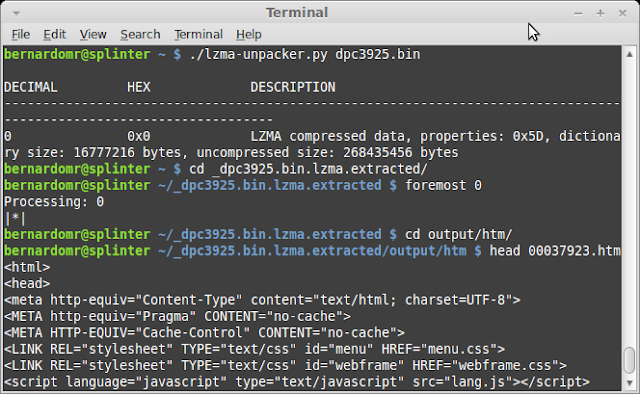 ImportError: cannot import name Binwalk"
Isn´t it easier to just add 00 00 00 10 00 00 00 00 manually with an hex editor and then "7zr e -y FIRMWARE.bin"? It´s a lot easier than waiting for a script correction as it´s outdated tho. All this was taken out from the script itself. Thanks Bernardo! Bernardo, can you give me a little help? I want to load the unpacked DPC3925 firmware in IDA Pro just to keep digging in and learning. Can you tell me how to do so? Just that. Hope it does`nt bother you. Thanks in advance and greetings form Argentina. I've just bought an EPC3925 second hand off eBay. It comes with a firmware that doesn't permit bridge mode. I've Google'd around a lot today trying to find fw, and now I'm seeing it's the cable ops pushing it, and I don't find any publicly available to download fw. I did try the HTML injection trick, but it didn't work. I read later others whom had tried it and also failed with the same FW as me. Does anyone know a location I could download a FW dump that would have bridge support please? 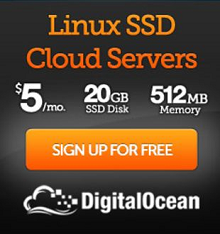 I'm in EU so it's EURODOCSIS I need. Any help anyone can offer would really be appreciated. Best place to find firmware files for Motorola/Arris modems?